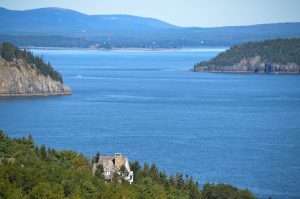 I’d always heard of Bar Harbor as a quaint little town in Northern Maine, on an island with Acadia National Park. I wasn’t quite prepared for how big a tourist attraction it is. Cruise ships unload hundreds of passengers into the village. Cars stream through constantly. The sidewalks are crowded. 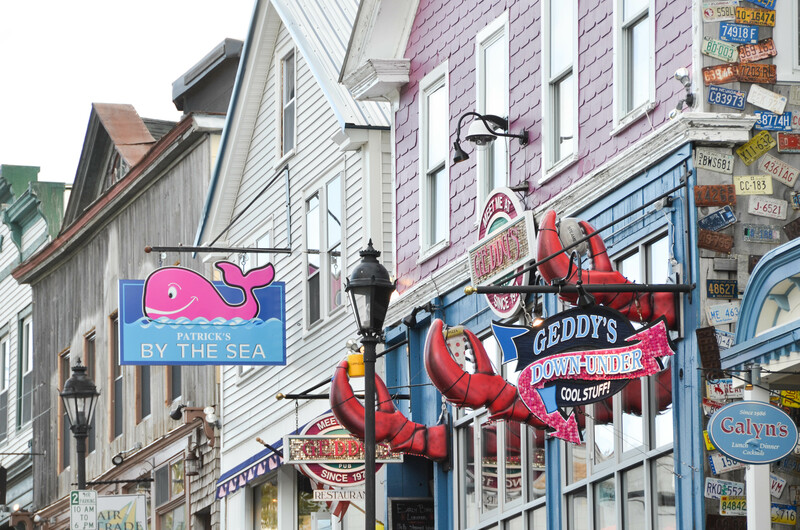 The town is mostly tourist shops and restaurants, the main road lined with fancy inns and rental cottages. The town was bustling, and it wasn’t even summer! We stayed at the Desert Sands RV Park, which was just 7 miles north of the town and right on the water. The place was pretty vacated at this point in the season, so we got a nice quiet site with a view. As soon as we were settled in, I drove into town for a few groceries and a quick look-around. Most of this large island is part of the national park, and we just explored the most popular part of it. We took the Park Loop around the northwest peninsula. It’s a nice road, one way for the most part, with lots of scenic pullovers. It was a beautiful sunny day, and the leaves were just beginning to change. The traffic wasn’t bad at all, so it made for a slow, relaxing tour. 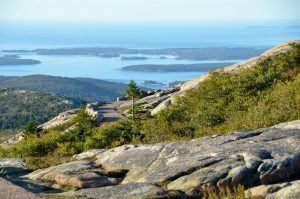 We drove to the top of Cadillac Mountain, which is the highest point on the North American east coast, and walked around to see views on all sides. My camera’s memory card was full at this point, so we had to do with our phone cameras. 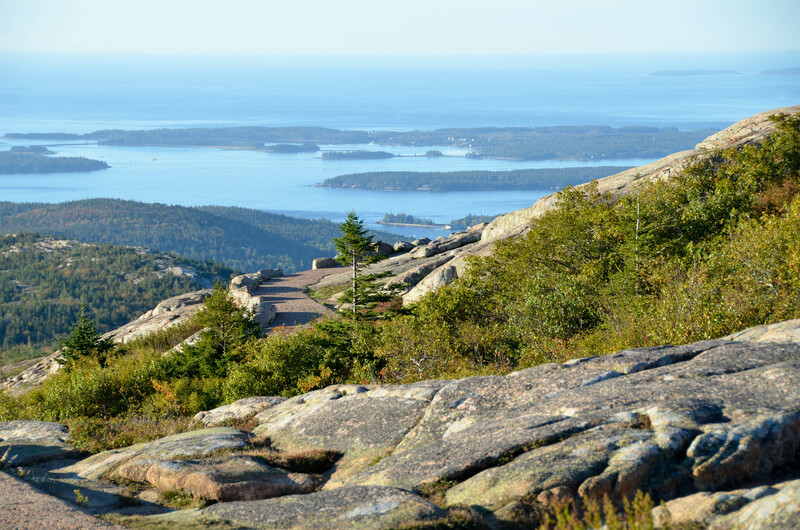 View from top of Cadillac Mountain. Two days later, I got up early the day we were leaving and drove up the mountain again to get a few shots with my real camera. It was nice to walk around up there without the crowds and get one last look at this beautiful area. 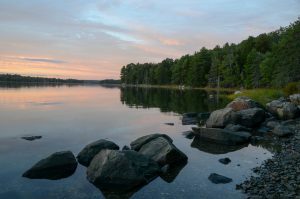 We walked around town some more, went to the post office to send off some care packages to kids, then went back to the campground to enjoy our lovely water view. We thought about driving up Cadillac Mountain for some sunset photos (a popular thing to do here), but clouds came up and it got cold. As it turned out, we had a pretty spectacular sunset right there at the campground. We loved our visit here and wished for longer. I can only imagine how lovely this place was before all of America’s tourists found it! 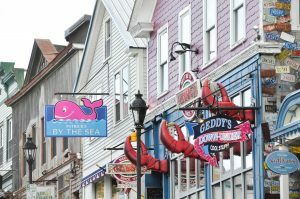 We were so excited to see your photo of Geddys, the restaurant with the lobster claws out front. We just had lunch there a few days ago! Great clam chowder. The fish and chips was a bit bland, but they have a marvelous grilled chicken on a bed of quinoa, kale and mushrooms with a balsamic reduction. 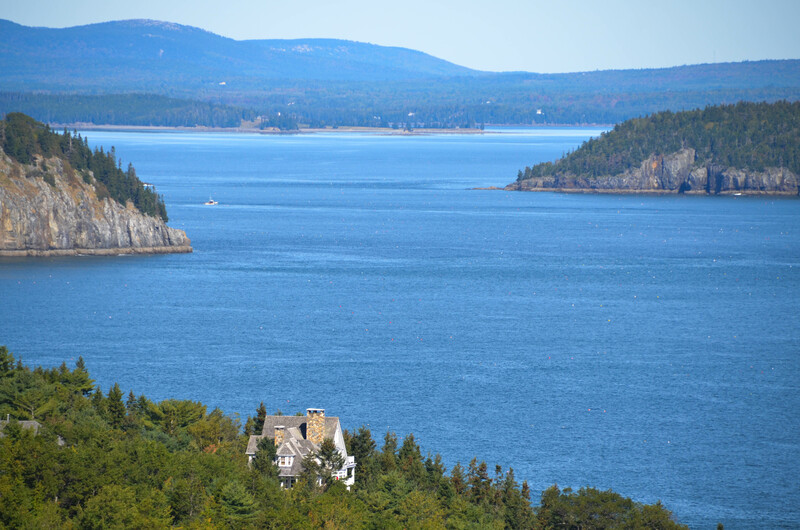 We hit Bar Harbor the day a cruise ship emptied about a thousand German tourists into town. With the help of gestures and mime, we took photos for some of them, and tried to help when clerks were uncomprehending.